What the Hell, Mike Gravel? This may be news to many of you. It's not pretty. It may upset you and let you down. Former Senator Mike Gravel (who read the 'Pentagon Papers' leaks into the public record) had been actively involved in the 9/11 truth & justice movement for the last year. In the United States, How Do I Get an Initiative on the Ballot? The initiative and referendum system is part of the American legal landscape in 24 states. In these states, citizens may write initiatives to amend the state Constitution or propose new statutes, and in some cases repeal laws with referendums. In the case of either an initiative or a referendum, the voting public decides on the outcome of the proposal during an election. In each state which allows citizens to put initiatives on the ballot, the process is slightly different, but the basics remain the same. The two main players in releasing the Pentagon Papers were Daniel Ellsberg and United States Senator Mike Gravel. Senator Gravel is the person who read the Pentagon Papers into the Congressional Record. This act made the papers public record, so that they could not be censored by the government. He was the only member of Congress courageous enough to do so. Both Ellsberg and Gravel - like many other high-level former officials in the government and intelligence services (including many well-known whistleblowers) - support a new 9/11 investigation. Ellsberg says that the case of a certain 9/11 whistleblower is "far more explosive than the Pentagon Papers". (Here's some of what that whistleblower says.) He also said that the government is ordering the media to cover up her allegations about 9/11. And he said that some of the claims concerning government involvement in 9/11 are credible, that "very serious questions have been raised about what they [U.S. government officials] knew beforehand and how much involvement there might have been", that engineering 9/11 would not be humanly or psychologically beyond the scope of those in office, and that there's enough evidence to justify a new, "hard-hitting" investigation into 9/11 with subpoenas and testimony taken under oath (see this and this). Gravel is now backing a California ballot initiative for a new 9/11 investigation. The text of the initiative is below. Will be archived here by Friday after the broadcast. The main players in releasing the Pentagon Papers were Daniel Ellsberg and Senator Mike Gravel. Ellsberg is, of course, the former military analyst and famed whistleblower who smuggled the Pentagon Papers out of the Rand Corporation. Senator Gravel is the person who read the Pentagon Papers into the Congressional Record. This act made the papers public record, so that they could not be censored by the government. Ellsberg and Gravel are receiving a lot of media attention right now for their support of Wikileaks. But little attention has been paid to Ellsberg and Gravel's support for a new 9/11 investigation. Former Alaska Senator and 2008 Democratic presidential candidate Mike Gravel told The Daily Caller in an exclusive interview that he is mulling a primary challenge to President Barack Obama in 2012. Progressives who view President Obama’s recent tax compromise with Republican leadership as a betrayal have suggested in recent days that a primary challenge to Obama in 2012 is not unimaginable. TheDC reported that some progressives have been floating names like Howard Dean, Russ Feingold, and even actor George Clooney as possible contenders. Sen. Mike Gravel, former Democratic senator from Alaska, who served two terms from 1969 to 1981, and a former candidate in the 2008 presidential election. Tune in to Democracy Now on Tuesday June 17th! 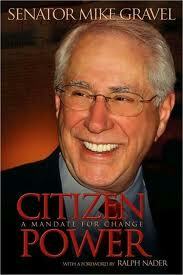 Amy Goodman will interview Mike Gravel regarding the NYC 9/11 Ballot Initiative as well as his recent books. If you're in NYC area, tune in to WBAI 99.5 FM at 9am. It's also available on MNN and other cable networks. Outside of NYC, go to www.democracynow.org to stream it, find your local radio or cable news outlet, or read the transcript. DENVER (AP) — The Libertarian Party on Sunday picked former Republican Rep. Bob Barr to be its presidential candidate after six rounds of balloting. Barr beat research scientist Mary Ruwart, who also sought the party's presidential nomination unsuccessfully in 1983, on the final ballot. The vote was 324-276. Barr endorsed Wayne Allyn Root, who was eliminated in the fifth round, to be his vice-presidential nominee. Barr left the GOP in 2006 over what he called bloated spending and civil liberties intrusions by the Bush administration. The former Georgia congressman said he's not in the race to be a spoiler. "I'm a competitor and I'm in this to win. I do not view the role of the Libertarian Party to be a spoiler and I certainly have no intention of being a spoiler," Barr said. A couple of weeks ago Mike Gravel was in Los Angeles. During the Q+A, I first thanked him for talking about the "military-industrial complex" in the 1st presidential debate, and then asked him to speak on the potential power of understanding false-flag operations as a mechanism of war and Empire. He proceeded to speak on his ideas for global democracy, making the convincing case that there already is global governance, it just has been hijacked, misused and abused. I then asked him again to speak specifically to my question. Although he brought up some interesting points, I remain unconvinced that a better "system" will cure us of our ongoing treasonous hijackings, and a bit puzzled by why he won't speak to the "false-flag" mechanism even in a historical sense.